Did you know that Nicole and I are in a feud? It’s cool, I don’t think she knows it either (we’re in a feud, Nicole!) We were cool when I moved to Maine because she still lived in Chicago but now that I live in Maine and she’s in Pennsylvania, it is on. In 2011, the Maine State Legislature considered naming the whoopie pie the official state pie. The proposal received bipartisan support. Regardless of where you stand on this VITALLY IMPORTANT ISSUE, Nicole and I have declared a truce about the true ownership of the whoopie pie. Mostly because we both have ovens and we can both make them ourselves, wherever we happen to live. And isn’t that what really matters? If the delight of shared foods can’t bring about world peace, how can we expect anything else do the job? So, here we are. 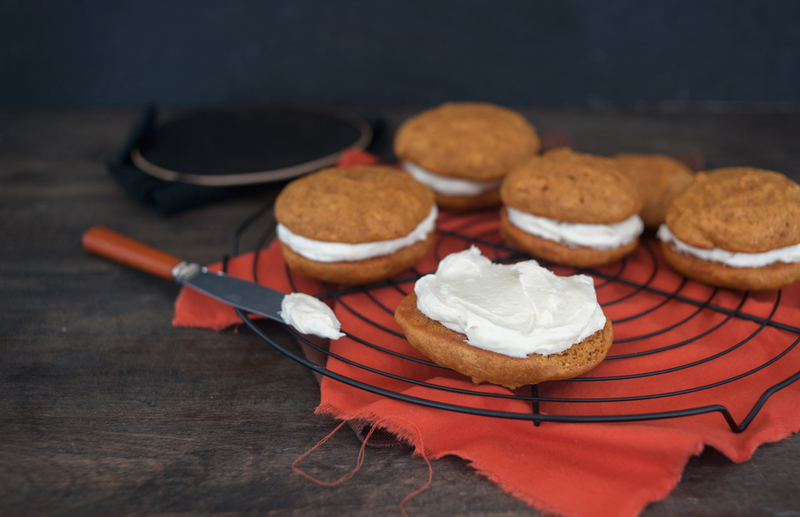 A simple, classic recipe for Pumpkin Whoopie Pies, a soft cookie sandwich with a sweet cream cheese filling, from the both of us, from PA and ME, to you. 1. Prep: Heat oven to 350° F with the racks in the upper and lower thirds. Line 2 large rimmed baking sheets with parchment. 2. In a medium bowl, whisk together the flour, pumpkin pie spice, baking powder, baking soda, and salt; set aside. 3. In a large bowl, whisk together the pumpkin puree, brown and white sugars, oil, egg, and vanilla until combined. Mix in the flour mixture until just moistened (do not overmix). 4. Drop mounds of the dough (about 2 tablespoons each) onto the baking sheets, spacing them 2 inches apart. 5. Bake until golden and firm to the touch, 12 to 14 minutes. 6. Let cool for 5 minutes on the pan, then transfer to a wire rack to cool completely. 7. With an electric mixer, beat the cream cheese, butter, confectioners’ sugar, and vanilla until fluffy, 2 to 3 minutes. 8. Spread a heaping tablespoon of filling on the flat side of half the cookies. Top with the remaining cookies. If soft, chill for 20 to 25 minutes. 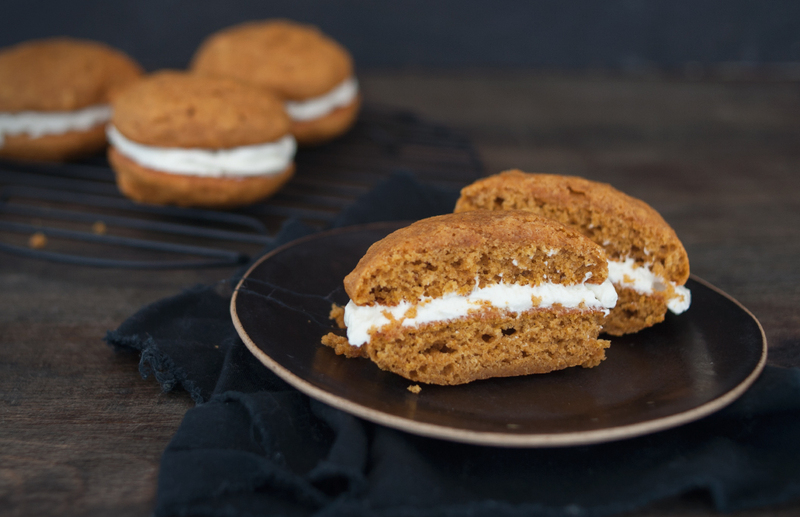 Storage suggestion: Keep the whoopie pies refrigerated, between sheets of wax paper in an airtight container, for up to 1 day. Bring to room temperature before serving, if desired. haha, whoever invented the whoopie pie, I am in love with. This version is awesome!